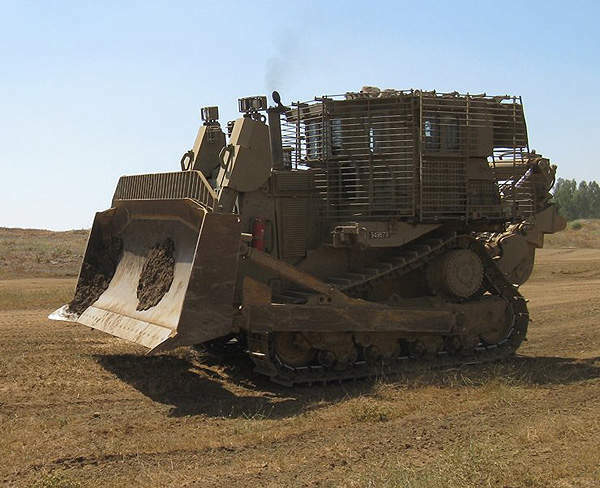 Armoured D9R Dozer is in service with the Engineer Corps of the Israel Defence Forces (IDF). Image courtesy of Michael Aronov. 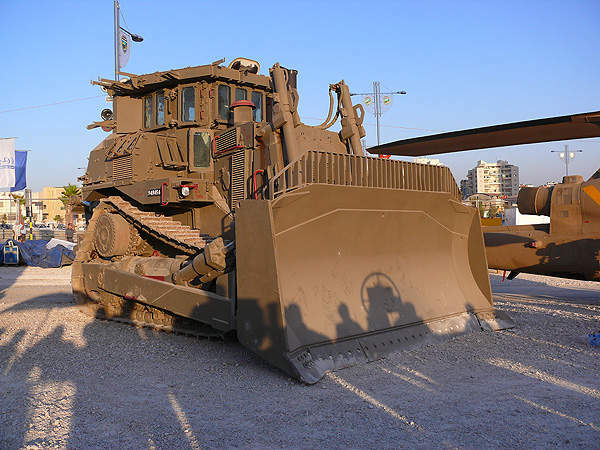 Armoured D9R Dozer of the Israel Defence Forces is based on the Caterpillar D9 track-type tractor. Image courtesy of MathKnight. D9R Dozer features add-on armour for providing optimum armour protection for crew members. Image courtesy of MathKnight. 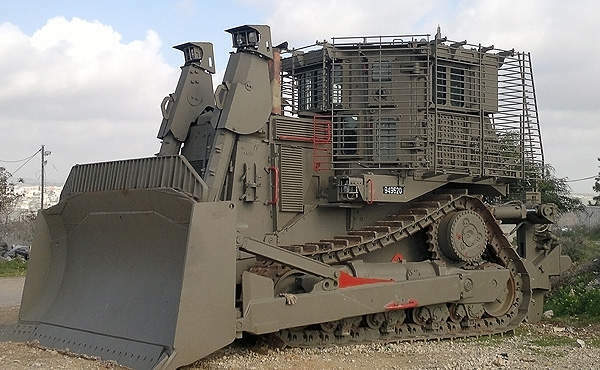 The slat armour on the Armoured D9R Dozer of Israel's Defence Forces. Image courtesy of MathKnight and Zachi Evenor. An Armoured D9R Dozer armed with an FN Mag machine gun performs during IDF training. Image courtesy of Michael Aronov. The Armoured D9R Dozer of the Israel Defence Forces (IDF) is the latest variation in the series of Caterpillar D9 armoured bulldozers. The vehicles are deployed by the Engineer Corps of the IDF. The D9 Dozer vehicles were first introduced in to the IDF in the 1950s. The vehicle was deployed in the Sinai War (1956), Yom Kippur War (1973), Operation Peace for Galilee (1982), Second Lebanon War (2006) and Operation Cast Lead (2008-2009). In June 2004, Israel Aerospace Industries, Ramta Division began deliveries of the D9R variants under a contract option exerted in 2003. IDF installed slat armour on many of these vehicles in 2006. D9T, a remote-controlled version of the D9R, is also in operation with the IDF. "In June 2004, Israel Aerospace Industries, Ramta Division began deliveries of D9R variants under a contract option exerted in 2003." D9R Dozer is an armoured variation of the Caterpillar D9 track-type tractor, designed and manufactured by Caterpillar. The base vehicle comes with a detachable large blade and a rear ripper attachment. The standard equipment includes weapon mounts, storage compartments, lighting and communication systems. The base vehicles are armoured by Israel Aerospace Industries, Israel Military Industries and IDF to provide optimum armour protection. The cabin can accommodate two men, including a driver and a commander. Armoured glass panels on the cabin provide maximum ballistic protection, allowing views of all vehicle components in all directions. The cabin is also fitted with communications, fire-suppression and personal weapon holding systems. The blade and rear ripper serve as primary working tools of the vehicle. The blade fitted at the front is controlled by four hydraulic arms. The D9R Dozer has a length of 8.1m, width of 4.5m and a height of 4m. An unarmoured dozer weighs 48t while an armoured one weighs 62t. Modified vehicles can be equipped with crew-operated machine guns, smoke grenade launchers or grenade launchers. The vehicle has provisions to be fitted with customer-specific communication equipment. The vehicle can shove sand, dirt and rubble with a blade. The vehicle can also push heavy objects such as large quantities of soil and main battle tanks. The rear ripper is used to loosen densely-compacted materials and rip out larger stones and frozen ground. 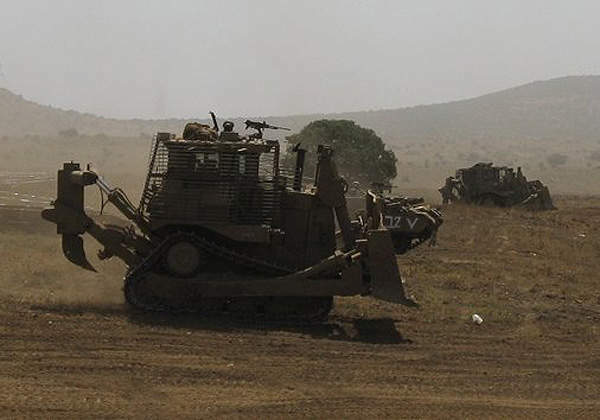 The D9 Dozer is used by the IDF as a front-line vehicle for anti-terrorism operations. The armoured D9R is deployed to support the IDF engineering units performing battlefield demolition /construction, route clearance and explosive ordnance disposal (EOD). The vehicle can also be used to detonate IEDs and explosives, as well as create access and egress routes for combat troops. The vehicle is used in non-combat military operations such as humanitarian demining, peacekeeping support, engineering tasks and disaster relief operations as well. The Armoured D9 Dozer provides high level of ballistic protection to match customer-defined threat levels. "D9R Dozer is an armoured variation of the Caterpillar D9 track-type tractor, designed and manufactured by Caterpillar." The components of the vehicle, including crew cabin, the hydraulic and electrical systems engine, fuel and oil tanks, are covered by customer-specified ballistic armour. The vehicle can protect the crew from bomb explosions, machine-gun fire and sniper fire. 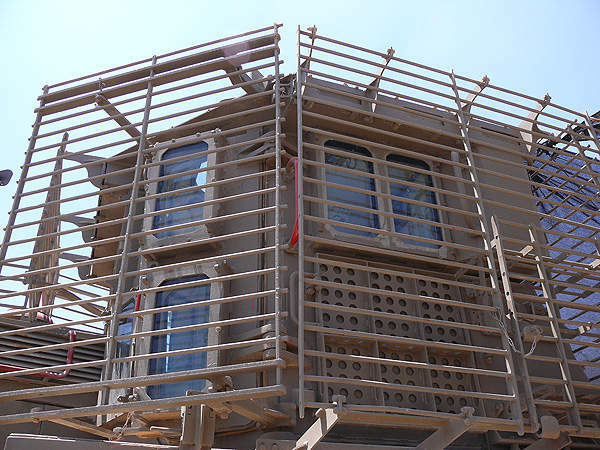 The slat armour installed by IDF provides additional protection against rocket-propelled grenade (RPG) rounds. Add-on armour kits increase the production-line weight of the D9 by about 15t. The armour has proven effective in thwarting attacks by hostile weapons. The D9R Dozer is powered by Cat 3408C engine coupled to a Cat planetary power shift transmission (three forward and three reverse). The engine delivers a net power of 405hp and drawbar pull of about 725kN. Vehicle speed and direction is controlled through a single lever control. The torque divider protects the drive-train from sudden torque impacts and vibration. The suspended undercarriage design cuts down the shock loads shifted to the undercarriage. The bogie suspension provides more ground contact, while operating on uneven surfaces.